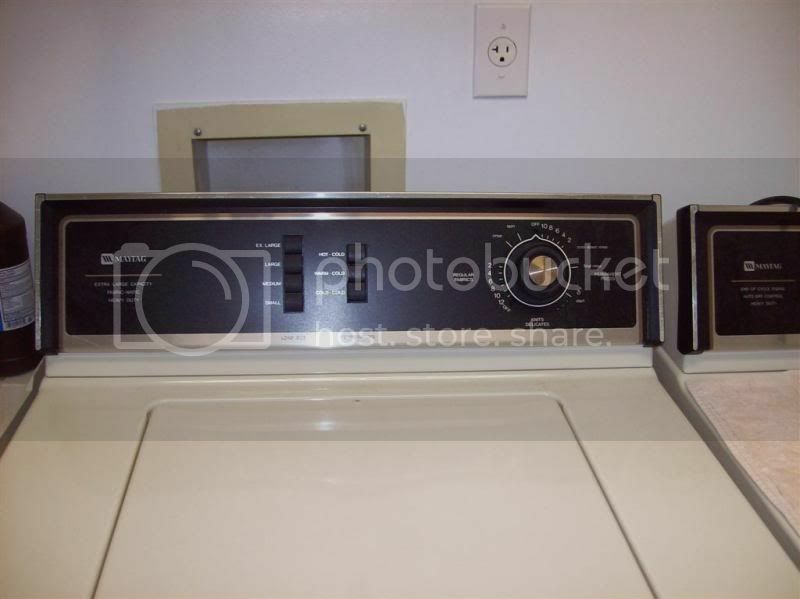 I have a Maytag Model LA8650 Washer that I purchased in 1991. It has never given me a day's worth of trouble until recently. During the spin cycle, it makes a terrible grinding/rattling/scraping sound. Sometimes it sounds like there are loose metal parts rattling around (like loose bearings or something), but not all of the time. It also seems to get off-balance very easily - even when the load is balanced . In the video, it gets off-balance even with nothing in the washer. The rasping sound is intermittent as you can hear in the video. Then it makes a different sort of grinding/rattling/scraping sound as it stops spinning. I checked the belts underneath and they seem fine. I can turn the belts by hand. I can find no evidence of any leaks. It washes clothes fine, does spin, and does drain the water fine. It doesn't leap or bang around. The only problem is that it makes that horrible noise during the spin cycle and stopping the spin cycle and both noises are definitely different/new than in the past. Please see some still photos and link to the video below. I sure would appreciate any help. Thanks very much! First of all, let me congratulate you on having a pristeen machine for being 17 years old. There are no signs of seal failure as your videos demonstrate, howevere the noise is coming from the inner tub striking the outer tub as it spins. This is due to years of wear on the tub bearings and boot mounting stem. To correct this condition requires a bearing and seal overhaul. The 2 parts needed are the 204013 tub bearing and the 22204012 Boot STem Kit. You also must have the Maytag spanner wrench to remove the tub and mounting stem. All in all, you would be facing a $350 repair if you call in somone. If you buy the parts and tools and use the manual on this website, you will spend about $120 on your own. Thank you so much for the help. I appreciate it. Do you think a semi-intelligent, semi-handy woman can tackle this job? Or is there a lot of muscle/strength involved? 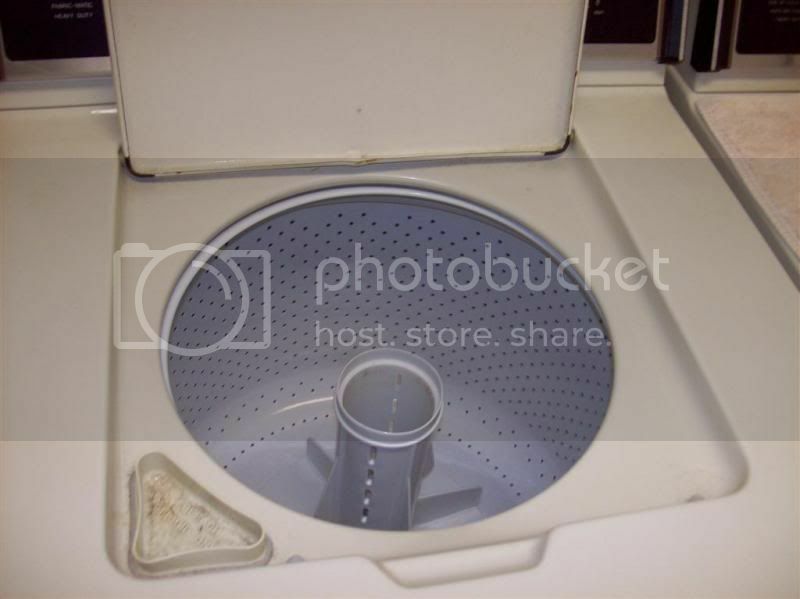 Also, is it worth $120 plus time to repair this old washer, or would I be better off in the long run buying a new one? Since it is so old, will other parts be expected to fail soon, too? The only heavy part of this whole job is lifting that dang steel tub out after removing the agitator & nut. The tubs have a solid concrete balance ring that really adds the weight to that bad boy. Other than that, this repair is fairly easy to do for just about anyone capable of following the instructions in the repair manuals. There are Maytag manuals both here and on my own site that many have used to do just this repair. This machine was designed to last, and $120 is certainly nothing compared to the 20 more years of life you can expect from it afterward. Maytag will never again make a product this reliable. One other note of mention if you get your spanner wrench and start removing stuff...the tub nut and the boot seal have left-hand threads. Many folks miss this during their repair process. Repair-man, you are awesome. Thanks for the great advice. So breaking apart and removing that spanner nut (tub nut) is not that hard? If not, I will go ahead and order the wrench and parts. Can you point me to where I can order the parts? Could you provide me to the link of the manuals on your site? By the way, what is your site? The only manuals I could find on the internet were for models numbers that started with "LATxxxx". My model is just "LA8650" without the "T". I was just reading about left-handed threads! Thanks for the pointer and reminder. By the way, I assume for left-handed threads it is the opposite of righty-tighty and lefty-loosey? I will turn clockwise to loosen? In my research, I read that if you have a noisy spin cycle, you should check the spin bearing, the bearing inside the top of the brake package. 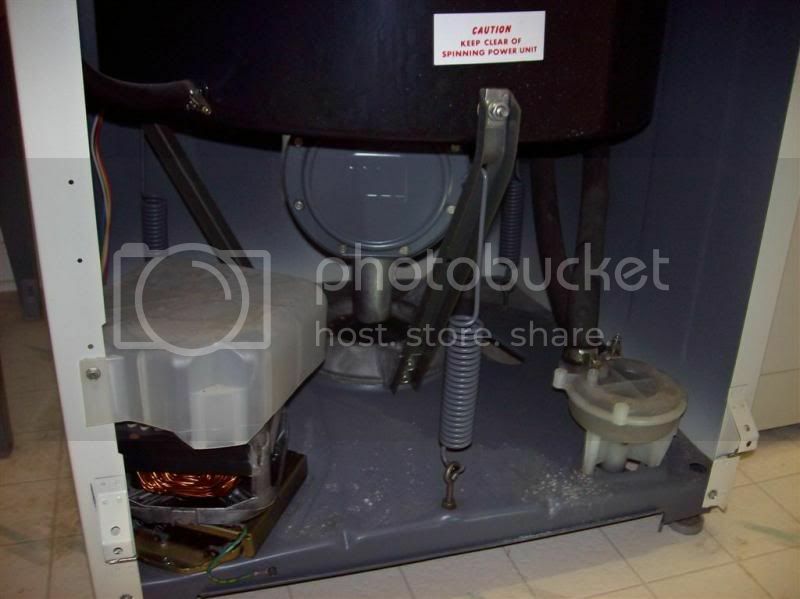 It went on to say that there are damper pads glued on the base that the washer assembly sits on, these pads are a "buffer" between the suspension assembly and the base. If these pads wear out, usually a grinding type of noise is noticed, especially in the spin mode. If so, you need to change the damper pads. 1 - Are the spin bearing and the tub bearing the same thing? 2 - Before I buy the tub bearing and boot stem kits, is there a way that I can rule out the damper pads as being the problem? If the spin bearing is different than the tub bearing, is there a way to rule that out, too? Carol, please don't pull a JW on me and get off track due to what you read somewhere else. I already listened to your video and made my diagnosis. You don't need damper pads or anything else. You might throw in a new set of belts, 12002425 to make the machine perfect as new. Any of your parts can be bought from the RepairClinic link on the right side of this page by typing in your mode number or the various part numbers I provided to you already. I sell the tools and manuals on my own site, but I'm not here to toot my own horn right now. Good luck and Happy Holdays! I will proceed as diagnosed. Again, thank you so much for the help. Please don't get me wrong about JW...he's priceless, but tends to wander off course during the diagnostic phase. Regarding your earlier questions, the tub nut turns to the right to remove, left to tighten as you are facing it. If the damper pads later become necessary to replace, there is an old trick I learned to replace them by just removing the front panel. 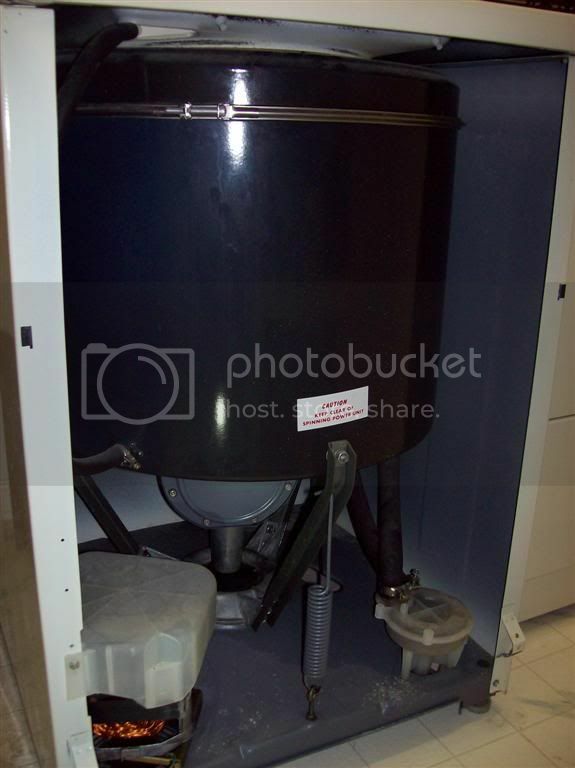 The whole machine is inverted onto an Igloo cooler or small table with the lid taped shut. At this point the entire tub assembly is dangling by the 3 tub springs and all the pads are exposed for replacement. Bada-bing! If you do it his way, you take a chance on bending the main pulley, but don't pay me no mind...when it starts howling and chewing up belts it will be too late . Those zany Canadians over at applianceaid have taken the Sublime course in appliance repair. They forgot that the thrust bearing which releases the brake sits inside that lower pulley, and the last thing we want to do is focus the entire weight of his heavy machine on that bearing and pulley. Trust me on that one. You really know your stuff, don't you! The spanner wrench, Washer Tub Bearing Kit (Part 204013), and Washer Mounting Stem & Boot Seal Kit (Part 22204012) all finally arrived. Got busy with the spanner wrench. I've whacked it around and around the center post with the rubber mallet. Must have slowly made three or four full circles. But the nut still does not spin freely. Yes, I am going in a clockwise direction. I can tell that it has unthreaded somewhat because the outer basket now spins easily. But it looks like I have a long way to go to get the nut off. How many times around will I need to go with the spanner wrench? Every time I walk by, I whack at it until I am tired. Is there any risk that I am stripping the threads? Or is this proceeding as normal? Also, would it be a good idea to spray anything on there like WD-40 or anything else to loosen it up? Is there anything that would help? ... because the outer basket now spins easily. Make that the inner basket.